Until this year I had never heard of Becca before, the blogging world went crazy for their highlighters and ever since I've been lusting after one but never got round to making the purchase. I originally tried to get their face palette when it first came out but it went out of stock so fast that I missed it, so when it came back in stock I purchased it straight away. First of all I love the packaging of this product its so pretty and high quality and definitely sturdy enough to travel with without worrying about it smashing. It also has a big mirror inside which is perfect. Rose Spritz is a lovely rosey pink blush shade with shimmer running through. Amaretto is a chocolatey brown shade I use as a bronzer as its matte with no shimmer which I like and it suits my pale skin tone but could also be used as a blush on more olive skin tones. Pamplemouse is quite a bright pink shade with a silverly shimmer for my skin tone its quite bright so it is my least used shade within the palette. 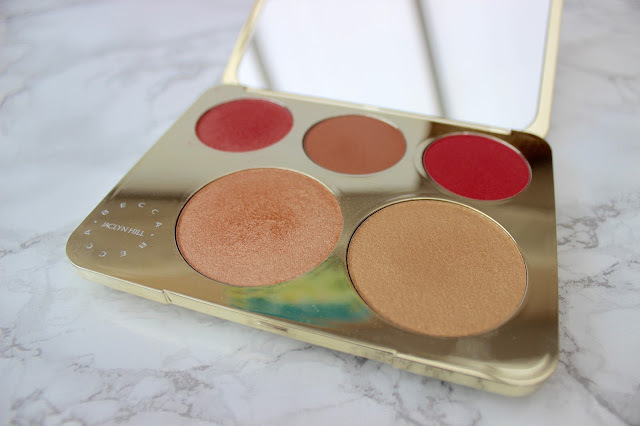 Champagne pop this is definitely my most used shade from the palette and a cult favourite its a pretty shimmery gold shade that literally does pop on your face I love it and have been using it everyday. Proseco pop is more of a yellowy shade than champagne pop which doesn't suit me as much as champagne pop but is still such a pretty shade. Overall I really impressed with this palette its such good value for money priced at £48 it isn't cheap but for the pan size of each of the products its really good considering one highlighter alone is £32. Each one is highly pigmented and buttery I honestly love each one. I'm desperate to try some more Becca X products!